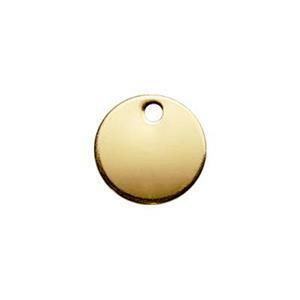 An itty bitty gold filled circle charm that adds a golden yellow flash to your shimmering creations. This 28 gauge blank is not recommended for hand stamping because it is too thin to take a clear impression. However, it makes the perfect dew drop accent on your gold filled designs. Cluster or layer these tiny disks for a shimmering sequin or fish scale effect. Or, dangle them along a length of chain or shoulder duster earrings for a bohemian gypsy look. This circle charm is small enough to blend in well with tassel or fringe designs too. Pair with our gold filled chain styles and explore countless jewelry design ideas.